This visually exciting book, which presents a selection of signature works by European and American artists of the postwar generations, is drawn from the UBS Art Collection. One of the richest and most varied holdings of international contemporary art in the United States, the Collection was begun in 1970 by Donald B. Marron, UBS’s American Chairman, a Vice Chairman and former President of the Museum, and a Trustee of the Museum since 1975. This unique publication accompanies an exhibition of 74 of these outstanding works of art, including 44 that were a gift to the Museum in 2002. 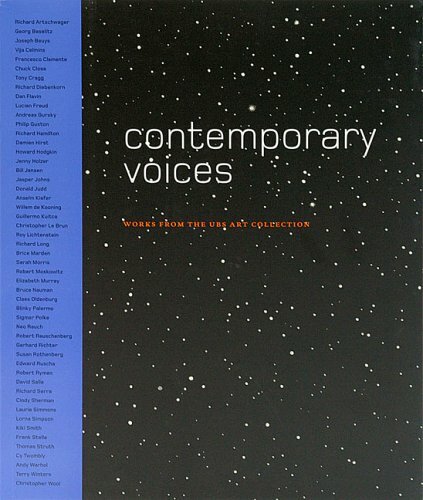 The works reproduced here include paintings, sculptures, drawings, photographs, and mixed-media pieces by a wide and varied array of significant artists, including Joseph Beuys, Chuck Close, Jasper Johns, Anselm Kiefer, Brice Marden, Robert Rauschenberg, Cindy Sherman, Kiki Smith, Cy Twombly, Andy Warhol, and many others. In addition, Ann Temkin, Curator in the Department of Painting and Sculpture, interviewed 11 of these artists for the book, producing illuminating conversations about how they work, the origins of their ideas, and other topics. The artists interviewed include Vija Celmins, Damien Hirst, Susan Rothenberg, Ed Ruscha, Robert Ryman, and Lorna Simpson. Also included is an interview with Donald B. Marron by Glenn D. Lowry, Director of The Museum of Modern Art.